The City of Detroit may be $18.5 billion in debt and about to initiate the largest municipal bankruptcy in U.S. history, but had you moved a little quicker this weekend, you could have owned it for the low, low price of $7.50. Free shipping, too! 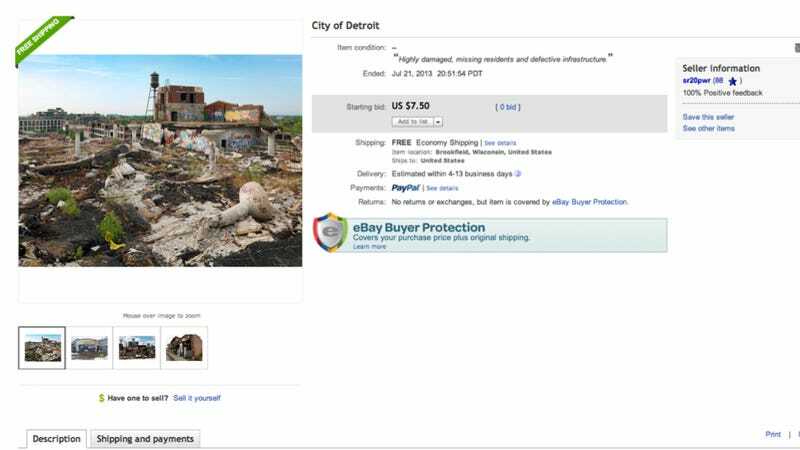 Someone tried to sell the beleaguered Motor City on eBay over the weekend, offering up a pretty sweet package deal. Listed under eBay's curious "Metaphysical - Other" category, here's a listing of everything you get as long as you were willing to contend with an item that is "Highly damaged, missing residents and defective infrastructure." Known for producing some of America's finest automobiles like the Chevy Vega and Ford Pinto, Detroit was once home to a bustling industrial and manufacturing economy. Unlimited use of the phrase, "Detroit Muscle"
The complete catalog of Motown Records albums including Diane Ross, Stevie Wonder and Marvin Gaye. You know, 'baby makin' music. Yeah, you know. Baby makin' music. Sadly, the item was ended by the seller because there appeared to be some kind of error in the listing, whatever that means. Maybe he didn't have the title to the city or something. It's a shame too, because if you won the auction and paid for it within five days you got Flint, Michigan — a $75 value — for free. What a deal! Hat tip to John Murphy!